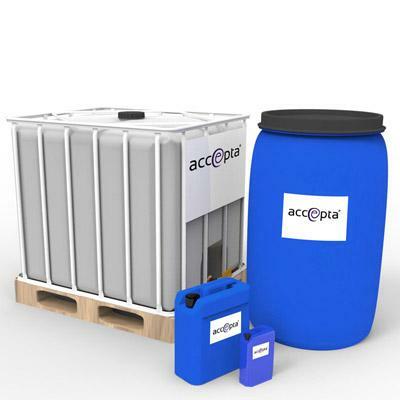 Accepta 2530 is a high performance, broad spectrum organic biocide scientifically formulated for the treatment of open re-circulating cooling systems. Accepta 2530 is a superior quality glutaraldehyde based treatment that is ideal for the control of bacteria, fungi and algae in open re-circulating cooling systems and evaporative condensers. Accepta 2530 is a proven high performing product that is that can be used where exceptional performance is critical. Accepta 2530 is low foaming and effective over a broad pH range. Typically Accepta 2530 should be dosed to give 200 ppm (200 g per 1000 lt). Dose at 400 ppm (400 g per 1000 Lt) for heavily fouled systems. Do not mix with other chemicals. Can be dosed by hand or through automatic dosing equipment. For further technical assistance concerning Accepta 2530 please contact Accepta.